Several years ago, I spent a Sunday afternoon tackling a very overgrown patch on my allotment. Some parsnips that had been left behind from a previous season had gone to seed. They were very tall and I removed them by tugging the huge stems after having snapped some of them in half. The following day my forearms had huge water filled blisters and it took me ages to work out what had happened. I thought that I’d burned my arms on the oven, the blistering was so severe, but clearly that hadn’t happened as surely I would have felt it?! After doing some research, I stumbled upon some information about parsnips and other plants in the same family and something called phytophototoxicity. I discovered that this is a photocontact dermatitis from the interaction of UVA radiation and photosensitising compounds found in various plants. This type of dermatitis is called phytophotodermatitis. 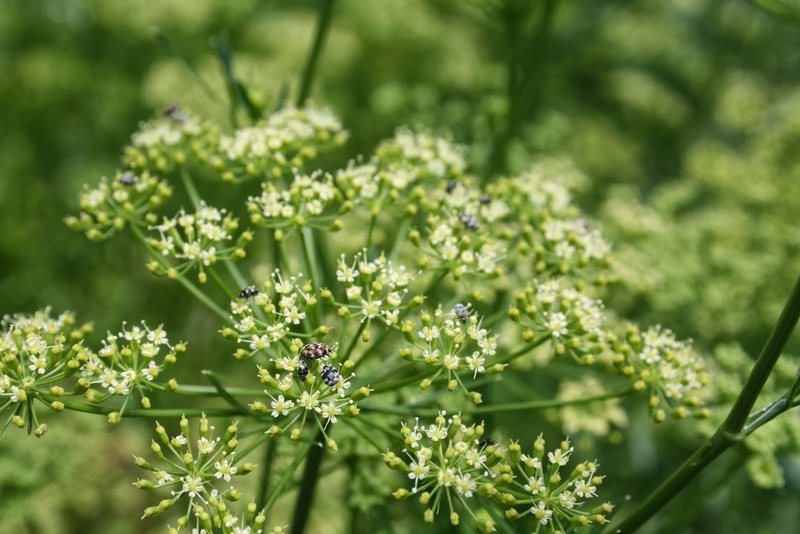 The most common plant family to cause phytophotodermatitis is the Umbellliferae family. Other plant families that cause phytophotodermatitis are: Rutaceae which includes lime, lemon and orange; Moraceae – fig; and Leguninosa – beans. The main photosensitising substances found in these plants are called furocoumarins. 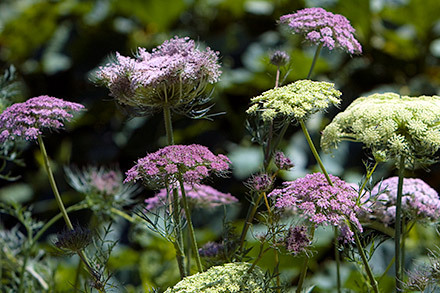 The Umbelliferae family includes parsnip, celery, parsley, carrot, cow parsley and giant hogweed etc. Their flowering heads are shaped liked umbrellas – so fairly distinguishable! The flowers are very pretty and the bees love them – however they can cause a very nasty reaction when the furocoumarins react in the skin when UVA radiation is present. So without sunlight this reaction will not happen! Yesterday I met somebody who had spent a day in her allotment and was baffled by the reaction on her arms which she thought perhaps was insect bites. When I asked her what she had been doing, she said pulling out parsnips that had gone to seed! So – time to do a blog post as there are sure to be others who are likely to put themselves at risk as this is not commonly known. Prevention is better than cure as they say… so if you are likely to come into contact with any of these plants, then best to cover up your skin when touching them and avoid sunlight. Also remember that UVA can penetrate glass so you don’t need to be outside to experience a reaction. Blisters or swellings may occur minutes to hours after exposure to the plant and light, but more usually erupt about 24 hours after exposure, peaking at 48-72 hours. Skin lesions may leave behind dark marking on the skin (postinflammatory hyperpigmentation). I am always warning people not to apply essential oils to the skin neat as these can cause an allergic reaction. However the kind of reaction described above is not an allergic reaction – it is the combination of UVA and the photo-sensitising agent which causes the damage to the skin. Some essential oils are phototoxic – namely the citrus oils (plant family Rutaceae) – just as any part of the plant including the juice would be too! Strictly speaking these aren’t essential oils, they are expressed oils because they don’t go through a distillation process – the oil is “squeezed” from the skin of the fruit. So if you are using Citrus “essential” oils – please ensure that you stay out of the sun!